GUITARS AND AMPS EXPO 2014: Hi, my name is Simon Cassidy and I am pleased to introduce you to our range of guitars and basses brought to you by our small independent family business from the North of England. Our company has developed out of my busy guitar-teaching studio and many years as a gigging guitarist, which has brought me into contact with hundreds of guitarists and offered unique insights into that common guitarist affliction, Gear Acquisition Syndrome. Our aim is to fulfil the needs of all guitarists, with the primary focus of producing high quality and affordable products. All of our standard guitars are built to our design and specification in China, where my eldest son Daniel is permanently based in order to ensure quality and consistency. I also make regular visits to China and make a point of personally inspecting all of our guitars and basses before they are shipped. When they arrive in the UK, they are meticulously checked and set up by me before being delivered to our customers. In addition to our standard range, we also produce a range of UK Custom Built guitars and basses. We assemble these guitars in the UK using premium globally sourced products. We have made a conscious decision to deal directly with our customers in order to ensure consistent quality, excellent customer service and great value for money. So if you buy one of our guitars you will be dealing with me personally. The Cassidy Axeman Series falls within a price range that is accessible to most guitarists, but offers a level of quality that will meet the expectations of the gigging guitarist. It also fully achieves Cassidy's primary mission of "making quality affordable". 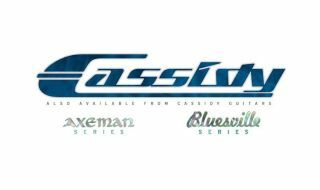 The Cassidy Bluesville Series sets out to provide a range of very affordable guitars based on classic designs from the 1950s. The series has been designed with the beginner / intermediate player in mind, but offers a surprising level of quality at this price point that has already tempted gigging guitarists. The Cassidy CE Series hand picks some of most stunning models combining traditional design with a range of beautifully detailed finishes. For more information please visit the official Cassidy website, or connect with them via Facebook and Instagram.